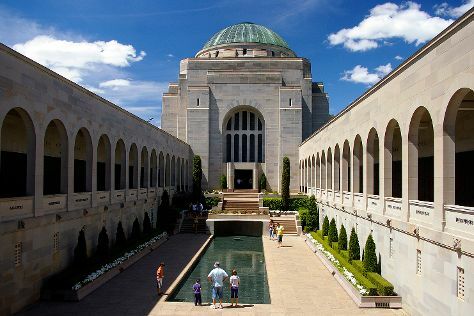 Satisfy your inner culture vulture at Australian War Memorial and St John the Baptist Church. You'll explore and learn at National Gallery of Australia and Questacon. There's still lots to do: explore the world behind art at National Portrait Gallery, get a sense of history and politics at Parliament of Australia, pause for some serene contemplation at Greek Orthodox Church of St Nicholas, and identify plant and animal life at Mulligans Flat Woodland Sanctuary. To see maps, where to stay, photos, and more tourist information, go to the Canberra journey site . In April in Canberra, expect temperatures between 24°C during the day and 7°C at night. Finish your sightseeing early on the 25th (Thu) to allow enough time to travel back home.